That's right folks. After a five or six week hiatus I am bringing back the Friday Book Giveaway. I will be offering a free book on most Fridays. 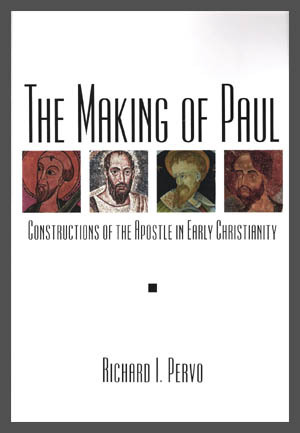 The influence of the apostle Paul in early Christianity goes far beyond the reach of the seven genuine letters he wrote to early assemblies. Paul was revered —and fiercely opposed —in an even larger number of letters penned in his name, and in narratives told about him and against him, that were included in our New Testament and, far more often, treasured and circulated outside it. Richard Pervo provides an illuminating and comprehensive survey of the legacy of Paul and the various ways he was remembered, honored, and vilified in the early churches. Numerous charts and maps introduce the student to the "family" of Pauline and anti-Pauline Christianities. I have been reading this book and have found it to be insightful. So place your name below and I will announce the winner on Sunday, July 24th. Remember, once I announce the winner you will have five days to claim the book or it will go back on the shelf for another day. One place that many people will visit when going to Israel is the Israel Museum where numerous artifacts on display. 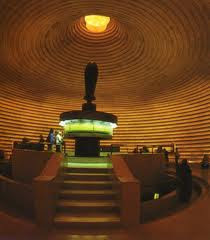 Part of the museum is the Shrine of the Book, a specially designed building with the sole purpose of preserving and displaying the Dead Sea Scrolls. The building resembles one of the jars in which some of the scrolls were found at Qumran. At the center of the building is the Great Isaiah scroll, the most complete and best preserved biblical text among the Dead Sea Scrolls. Visitors can walk around the scroll and examine this more than 2000 year old copy of Isaiah. But if you can't get to Israel you can now see the scroll, minus the museum setting. Jim Davila notes that an online version of the scroll can be viewed at the Israel Museum web site. You can roll the scroll to various spots and zoom in on the ancient Hebrew text. It even tells you what column you are in so you can compare the actual scroll with whatever translation you are using. Incidentally, you can also view the Temple Scroll as well. Both pages will take some time to load the first time you view it, but afterwards it is easy to use. Beginning at sunset last night, Jews around the world will began to commemorate the destruction of the temple by the Romans in 70 CE. 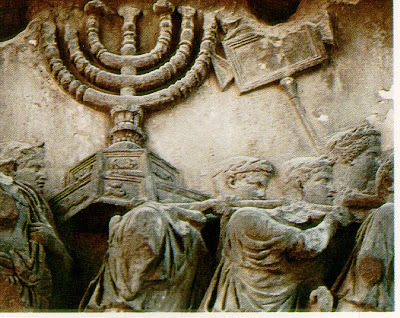 This holiday is known as Tisha B'Av (the ninth of Av), which is the day on the Jewish calendar the traditionally marks the destruction of both Solomon’s and Herod’s temple. Today’s picture is of rock tumble from the Roman destruction laying as it was found when archaeologists uncovered it in the 1960s and 70s. Are the temple treasures hidden under a toilet in John the Baptist's hometown? Lest my regular readers fear that this blog is going down the toilet, let me assure you that it is a coincidence that today's and yesterday's posts both have to do with toilets. These are serious topics in archaeology and history. But yes, I still sometimes snicker at potty jokes. Apparently a building project in the city of Ein Karem, a suburb of Jerusalem, is causing quite a stir. Ha Aretz is reporting that plans to build a bathroom/garden shed has the local residents in an uproar. The proposed building is too big to be just a lavatory and shed, which has conspiracy theorists suspicious that something else is afoot. Ein Karem is the traditional site of the John the Baptist's hometown and the place where, according to Luke, Mary went to stay with her aunt Elizabeth. 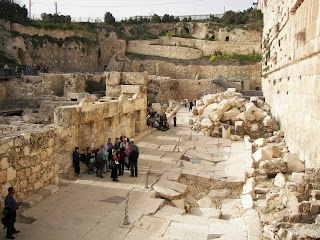 It has become an important tourist/religious site along with Jerusalem, Bethlehem, and Nazareth. So local angst over the building project is understandable since the residents want to be sure that the site remains welcoming for visitors. 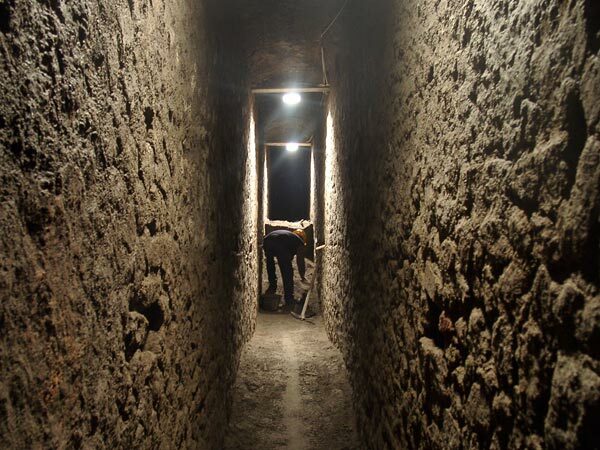 Among the many claims being made about the project is that the building is actually a secret storage site for treasures from the second temple. One man is claiming that these are the mysterious treasures described in the copper scroll. Here is what the article has to say. But Ron Havilio, a neighborhood resident and leading opponent of the project who has researched Ein Karem's history extensively, believes the archaeological loss may have been even greater. There is a well-known legend about a Palestinian treasure being buried in one of the neighborhood's houses during the War of Independence in 1948, and Havilio - who is distantly related to Yossi Havilio - claims this legendary treasury may actually have comprised treasures from the Second Temple. His source for this claim is the Copper Scroll, one of the Dead Sea Scrolls discovered in 1952. The scroll, which was written on metal, details the places where the Second Temple's treasures were hidden after its destruction in 70 C.E. Among other things it says: "At the ashuach in Beit Hakerem, when you go 10 cubits to the left, are 62 talents of silver." The accepted view is that "ashuach" signifies a reservoir and that the ancient Beit Hakerem is the modern-day neighborhood of Ein Karem. The only question, Havilio argued, is the location of the ancient pool referred to in the scroll - and analyses of the area's former geography indicate that one possible answer is right under the giant lavatory. "There is a chance, even if only a small one, that an exciting discovery could be made at Ein Karem, one of the most important discoveries in Israel of the last 100 years," he said. Jim Davila doubts there is any real connection to the Copper Scroll and I too have my doubts. People have been looking for this treasure for years and no one has any idea if it is a real treasure much less where it is hidden. Perhaps the building is to hold the Ark of the Covenant? Maybe the Smithsonian no longer wants to store it. One person's crap is another person's treasure. Among his many skills, my father was a plumber. He started in the plumbing business before he expanded into other aspects of the building industry. Once, while I was helping him to clear a waste line in someone's house, he must have noticed my lack of enthusiasm for the job and offered my a bit of plumbers wisdom. "One man's crap is another man's bread and butter." Gross, I know, but he did quite well as a plumber and there are very few of us who can do without them. I suspect there have been some who were willing to pay a plumber any price to fix a household disaster. Similarly, archaeologists also love to dig in other people's garbage. It is amazing how what someone threw away thousands of years ago is valuable to us now. Makes you wonder what archaeologists will say about us in the future. In light of all of the above, I want to point out an National Geographic article which describes some recent excavations in the sewers of Herculaneum. This ancient Roman city was destroyed by the same volcanic eruption that destroyed Pompeii. It is an archaeological dream since no subsequent settlements were built on the remains. Researchers simply have to dig through the ash to discover what was left behind in the destruction of 70 CE. In this case, however, they are sifting through the refuse of Herculaneum's sewers. Here is a portion of the article. Ten tons of the stuff has been excavated from a cesspit beneath the ancient town of Herculaneum, near Naples. Flushed down sewers from apartment blocks and shops, the deposit—the largest collection of ancient Roman garbage and human waste ever found, researchers say—dates to about A.D. 79. That year a catastrophic volcanic eruption of Mount Vesuvius buried Herculaneum, along with its more famous neighbor, Pompeii. Lost jewelry, coins, and semiprecious stones from a gem shop have been found, along with discarded household items such as broken lamps and pottery, according to Wallace-Hadrill, director of the Herculaneum Conservation Project, a Packard Humanities Institute initiative. And, coming from a onetime district of shopkeepers and artisans, the organic material has revealed just what your run-of the-mill Roman might have eaten in this coastal town, according to project scientists, who collaborated with the British School at Rome and the archaeological authorities for Naples and Pompeii. So next time you flush something, keep in mind that someone may be studying it in the future. I find this story interesting not only because I am a New Testament scholar, but also because the Gospel is from Durham where I earned my PhD at the University of Durham. Cuthbert's grave is in Durham Cathedral and Lori and I visited Lindisfarne (aka Holy Island), Cuthbert's initial place of internment, several times. St Cuthbert, also known as the "wonder worker of Britain," died in AD 687 and was buried on the Northumbrian island of Lindisfarne. He was widely regarded as Britain's most popular saint up until the murder of Thomas Becket in Canterbury Cathedral in 1170. When Viking raiders invaded Lindisfarne in 875, a group of monks fled, taking Cuthbert's body with them. After seven years of traveling with the body, the monks finally buried the saint again at what became Durham Cathedral. The book was found with him when his coffin was reopened in 1104. The book, written in Latin, is the Gospel of John. After it was taken from the coffin it was placed in a new shrine behind the altar of Durham Cathedral. After the Dissolution of the Monasteries in England by Henry VIII in the 16th century, the text passed to a series of private collectors. 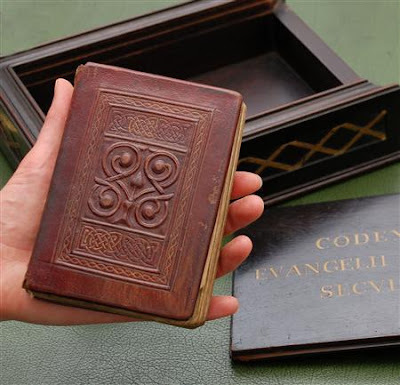 The BBC also has the story and below is a video describing the campaign to purchase the Gospel as well as the British Library's plans to digitize the text and to allow it to be displayed in Durham.